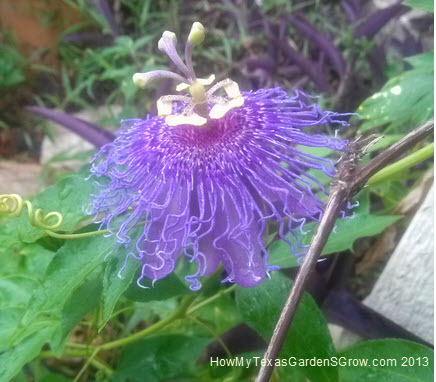 The passion vine grows in zones 7-10 and is a native plant in the United States. There are a number of colors, mine is purple but I’d love to find one of the reds! This one was planted recently, a gift from my sister-in-law, JoAnn’s garden—her vine dies back in the winter (but not completely) and it is grown in partial shade. JoAnn found several seedlings near the mature vine, so it’s probably not a hybrid and I plan to try growing it from seed next Spring. I’ve got this one growing near the house on the East side and so far it has defied the heat with about 2 feet of growth and 4 flowers so far–there were an additional 6 flower buds when I checked this morning. The Flowers last a day each, so it’s good to see additional buds. I’ll keep watch on this one to share more growing tips.